Beds are a mainstay in any household, and any place that lacks beds – of any sort – clearly needs a revamp of their creature comforts. Today, there are handmade and factory-churned out beds up for grabs, and nobody in the civilised world has to settle for anything other than a soft mattress on a simple or elegant bedframe. However, there is a thin line that separates a good bed from a so-so bed, and in most cases, it all boils down to craftsmanship. With the advent of the Industrial Revolution, greater and greater strides in the creation of mass-produced goods became possible, so much so that today everything from food to clothes is mass-produced. But there is something about hand-made things, and hand-made beds in particular, that makes these truly stand out from the crowd. Here are five reasons why handmade beds are better. 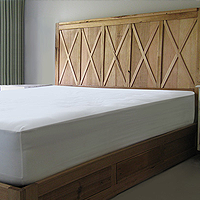 Durability – compared to most factory-made beds, handmade ones are far more durable. This in part is due to the fact that they’re made from materials of higher quality, but also because they are more carefully constructed. Flair – something that mass-produced beds simply do not have. Whether it’s the simple and often understated elegance of polished wood and beautiful grain, or the decadent beauty of richly carved wood or wrought metal, these ‘grace-notes’ aren’t something you can easily find in mass-produced products. Variety – there is a reason why mass-produced beds look the way they do – bland and uniform. It’s easier to produce something in a production line, which is why they all look the same, but this is something you’ll never have to settle for with hand-made beds. Hand-made beds offer the widest range of variety, from the simplistic to the most ornate – the cheapest to the priciest, if its variety you’re after, handmade is the only way to go. Resale value – artisanal hand-made pieces aren’t just pricey because they’re handmade. They’re pricey because they’re an investment that can pay off in the long run. Older, well-maintained pieces can go up in price, given time and demand, even older handmade pieces that have been around for decades or more can become prized as antiques in the long-run. Affordability – this may sound a bit confusing, since it is a well-known fact that most handmade beds can be pricey, but considering that it is a one-time investment and you won’t need to replace it anytime soon, it worth it, as you will not need to invest in unnecessary repairs or replacements, granted that a piece is taken care of properly. This affordability also extends to possible repurposing and recycling of old pieces to make new ones, which would be marginally cheaper than brand-new pieces. If you’re looking for a quality maker of top-quality handmade beds that will stand the test of time; a bed that will prove to be an heirloom worth passing down to your descendants, then visit Wenborn Wood – Australia’s top custom-made bed manufacturer.